For the minor league baseball team, see Pueblo Indians (baseball). The Puebloans or Pueblo peoples, are Native Americans in the Southwestern United States who share common agricultural, material and religious practices. When Spaniards entered the area beginning in the 16th century, they came across complex, multi-story villages built of adobe, stone and other local materials, which they called pueblos, or towns, a term that later came to refer also to the peoples who live in these villages. There are currently 19 Pueblos that are still inhabited, among which Taos, San Ildefonso, Acoma, Zuni, and Hopi are the best-known. Pueblo communities are located in the present-day states of New Mexico, Arizona, and Texas, mostly along the Rio Grande and Colorado rivers and their tributaries. The term Anasazi is sometimes used to refer to Pueblo people but it is now largely dispreferred. Anasazi is a Navajo word that means Ancient Ones or Ancient Enemy, hence Pueblo peoples' rejection of it (see exonym). Puebloans speak languages from four different language families, and each Pueblo is further divided culturally by kinship systems and agricultural practices, although all cultivate varieties of maize. Despite increasing pressure from Spanish and later Anglo-American forces, Pueblo nations have maintained much of their traditional cultures, which center around agricultural practices, a tight-knit community revolving around family clans and respect for tradition. Puebloans have been remarkably adept at preserving their core religious beliefs all the while developing a syncretic approach to Catholicism. In the 21st century, some 35,000 Pueblo are estimated to live in New Mexico and Arizona. Despite various similarities in cultural and religious practices, scholars have proposed divisions of contemporary Pueblos into smaller groups based on linguistic and individual manifestations of the broader Puebloan culture. The clearest division between Puebloans relates to the languages they speak. Pueblo peoples speak languages from four distinct language families, which means these languages are completely different in vocabulary, grammar and most other linguistic aspects. As a result each Pueblo language is often completely unintelligible to the other languages, with English now working as the lingua franca of the region. Keresan: family to which Western and Eastern Keres belong, considered by some a language isolate consisting of a dialect continuum spoken at the pueblos of Acoma, Laguna, Santa Ana, Zia, Cochiti, Kewa, and San Felipe. Towa: currently solely spoken at Jemez Pueblo. Tewa: the most widespread Tanoan language with several dialects, spoken at Ohkay Owingeh, San Ildefonso, Santa Clara, Tesuque, Nambé, and Pojoaque Pueblos. Northern Tiwa: a language with two dialects, one spoken at Taos and the other at Picuris. Southern Tiwa: also consisting of two dialects, spoken at Sandia and Isleta Pueblos. Uto-Aztecan: stock to which Hopi belongs, spoken exclusively at Hopi Pueblo. Zuni: family to which Zuni belongs; it is a language isolate, currently spoken exclusively at Zuni Pueblo. Anthropologists have studied Pueblo peoples extensively and published various classifications of their subdivisions. In 1950, Fred Russell Eggan contrasted the peoples of the Eastern and Western Pueblos, based largely on their subsistence farming techniques. The Western or Desert Pueblos of the Zuni and Hopi specialize in dry farming, compared to the irrigation farmers of the Eastern or River Pueblos. Both groups cultivate mostly maize (corn), but squash and beans have also been staple Pueblo foods all around the region. In 1954, Paul Kirchhoff published a division of Pueblo peoples into two groups based on culture. The Hopi, Zuni, Keres and Jemez each have matrilineal kinship systems: children are considered born into their mother's clan and must marry a spouse outside it, an exogamous practice. They maintain multiple kivas for sacred ceremonies. Their creation story tells that humans emerged from the underground. They emphasize four or six cardinal directions as part of their sacred cosmology, beginning in the north. Four and seven are numbers considered significant in their rituals and symbolism. In contrast, the Tanoan-speaking Puebloans (other than Jemez) have a patrilineal kinship system, with children considered born into their father's clan. They practice endogamy, or marriage within the clan. They have two kivas or two groups of kivas in their pueblos. Their belief system is based in dualism. Their creation story recounts the emergence of the people from underwater. They use five directions, beginning in the west. Their ritual numbers are based on multiples of three. 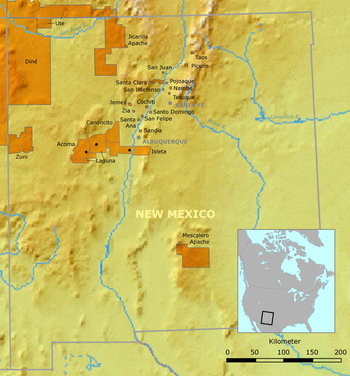 Puebloan societies contain elements of three major cultures that dominated the Southwest United States region before European contact: the Mogollon Culture, whose adherents occupied an area near Gila Wilderness; the Hohokam Culture; and the Ancestral Puebloan Culture who occupied the Mesa Verde region of the Four Corners area. Archeological evidence suggest that people partaking in the Mogollon /moʊɡəˈjoʊn/ culture were initially foragers who augmented their subsistence through the development of farming. Around the first millennium CE, however, farming became the main means to obtain food. Water control features are common among Mimbres branch sites, which date from the 10th through 12th centuries CE. The nature and density of Mogollon residential villages changed through time. The earliest Mogollon villages were small hamlets composed of several pithouses (houses excavated into the ground surface, with stick and thatch roofs supported by a network of posts and beams, and faced on the exterior with earth). Village sizes increased over time and, by the 11th century, villages composed of ground level dwellings made with rock and earth walls, with roofs supported by post and beam networks, became common. Cliff-dwellings became common during the 13th and 14th centuries. Hohokam is term borrowed from the O'odham language, used to define an archaeological culture that relied on irrigation canals to water their crops since as early as the 9th century CE. Their irrigation system techniques allowed for its adherents to expand into the largest population in the Southwest by 1300. Archaeologists working at a major archaeological dig in the 1990s in the Tucson Basin, along the Santa Cruz River, identified a culture and people that were ancestors of the Hohokam who might have occupied southern Arizona as early as 2000 BCE. This prehistoric group from the Early Agricultural Period grew corn, lived year-round in sedentary villages, and developed sophisticated irrigation canals from the beginning of the common era to about the middle of the 15th century. Within a larger context, the Hohokam culture area inhabited a central trade position between the Patayan situated along the Lower Colorado River and in southern California; the Trincheras of Sonora, Mexico; the Mogollon culture in eastern Arizona, southwest New Mexico, and northwest Chihuahua, Mexico; and the Ancestral Puebloans in northern Arizona, northern New Mexico, southwest Colorado, and southern Utah. 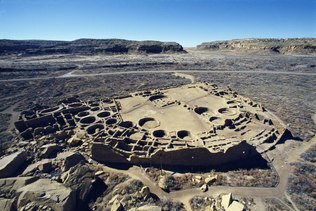 The Ancestral Puebloan culture is known for the stone and earth dwellings its people built along cliff walls, particularly during the Pueblo II and Pueblo III eras, from about 900 to 1350 AD in total. The best-preserved examples of the stone dwellings are now protected within United States' national parks, such as Navajo National Monument, Chaco Culture National Historical Park, Mesa Verde National Park, Canyons of the Ancients National Monument, Aztec Ruins National Monument, Bandelier National Monument, Hovenweep National Monument, and Canyon de Chelly National Monument. These villages were accessible only by rope or through rock climbing. However, the first Ancestral Puebloan homes and villages were based on the pit-house, a common feature in the Basketmaker periods. Villages consisted of apartment-like complexes and structures made from stone, adobe mud, and other local materials, or were carved into the sides of canyon walls. Design details from Ancestral Puebloan villages contain elements from cultures as far away as present-day Mexico. In their day, these ancient towns and cities were usually multistoried and multipurposed buildings surrounding open plazas and viewsheds. They were occupied by hundreds to thousands of Ancestral Pueblo peoples. These population complexes hosted cultural and civic events and infrastructure that supported a vast outlying region hundreds of miles away linked by transportation roadways. By about 700 to 900 AD, the Puebloans began to move away from ancient pit houses dug in cliffs and to construct connected rectangular rooms arranged in apartment-like structures made of adobe and adapted to sites. By 1050, they had developed planned villages composed of large terraced buildings, each with many rooms. These apartment-house villages were often constructed on defensive sites: on ledges of massive rock, on flat summits, or on steep-sided mesas, locations that would afford the Puebloans protection from raiding parties originating from the north, such as the Comanche and Navajo. The largest of these villages, Pueblo Bonito in Chaco Canyon, New Mexico, contained around 700 rooms in five stories; it may have housed as many as 1000 persons. Pueblo buildings are constructed as complex apartments with numerous rooms, often built in strategic defensive positions. The most highly developed were large villages or pueblos situated at the very top of the mesas, the rocky tablelands typical to the Southwest. Before 1598, Spanish exploration of the present-day Pueblo areas was limited to an assortment of small groups. A group of colonizers led by Juan de Oñate arrived at the end of the 16th Century as part of an apostolic mission to convert the Natives. Despite initial peaceful contact, Spain's attempts to dispose of Pueblo religion and replace it with Catholicism became increasingly more aggressive, and were met with great resistance by Puebloans, whose governmental structure was based around the figure of the cacique, a theocratic leader for both material and spiritual matters. Over the years, Spaniards' methods grew harsher, leading to a series of revolts by the Puebloans. The Pueblo Revolt that started in 1680 was the first led by a Native American group to successfully expel colonists from North America for a considerable number of years. It followed the successful Tiguex War led by Tiwas against the Coronado Expedition in 1540-41, which temporarily halted Spanish advances in present-day New Mexico. The 17th Century's revolt was a direct consequence of growing discontent among the Northern Pueblos against the abuses of the Spaniards, which finally brewed into a large organized uprising against European colonizers. The events that led to the Pueblo Revolt go back at least a decade before the formal uprising began. In the 1670s, severe drought swept the region, which caused both a famine among the Pueblo and increased the frequency of raids by the Apache. Neither Spanish nor Pueblo soldiers were able to prevent the attacks by the Apache raiding parties. The unrest among the Pueblos came to a head in 1675, when Governor Juan Francisco Treviño ordered the arrest of forty-seven Pueblo medicine men and accused them of practicing sorcery. Four of the medicine men were sentenced to death by hanging; three of those sentences were carried out, while the fourth prisoner committed suicide. The remaining men were publicly whipped and sentenced to prison. When the news of the killings and public humiliation reached Pueblo leaders, they moved in force to Santa Fe, where the prisoners were held. Because a large number of Spanish soldiers were away fighting the Apache, Governor Treviño was forced to release the prisoners. Among those released was a Ohkay Owingeh Tewa man named Popé. 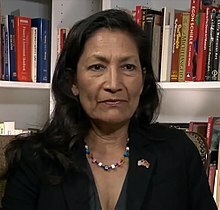 After being released, Popé took up residence in Taos Pueblo far from the capital of Santa Fe and spent the next five years seeking support for a revolt among the 46 Pueblo villages. He was able to gain the support of the Northern Tiwa, Tewa, Towa, Tano, and Keres-speaking Pueblos of the Rio Grande Valley. The Pecos Pueblo, 50 miles east of the Rio Grande pledged its participation in the revolt as did the Zuni and Hopi, 120 and 200 miles respectively west of the Rio Grande. At the time, the Spanish population was of about 2,400 colonists, including mixed-blood mestizos, and Indian servants and retainers, who were scattered thinly throughout the region. Starting early on August 10, 1680, Popé and leaders of each of the Pueblos sent a knotted rope carried by a runner to the next Pueblo; the number of knots signified the number of days to wait before beginning the uprising. Finally, on August 21, 2,500 Puebloan warriors took the colony's capital Santa Fe from Spanish control, killing many colonizers, the remainder of whom were successfully expelled. 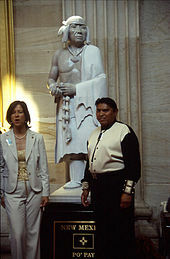 On September 22, 2005, the statue of Po'pay (Popé), the leader of the Pueblo Revolt, was unveiled in the Capitol Rotunda in Washington, D.C. The statue was the second commissioned by the state of New Mexico for National Statuary Hall; it was the 100th and last to be added to the collection, which represents the Senate. It was created by Cliff Fragua, a Puebloan from Jemez Pueblo, New Mexico. It is the only statue in the collection to be created by a Native American. 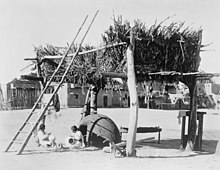 A Zuni drying platform for maize and other foods, with two women crafting pottery beneath it. From the Panama-California Exposition, San Diego, California. January 1915. The Puebloans are traditional weavers of cloth and have used textiles, natural fibers and animal hide in their cloth-making. Since woven clothing is laborious and time-consuming, every-day style of dress for working around the villages has been more spare. The men often wore breechcloths. Corn is the most readily recognizable staple food for Pueblo peoples. Although it is possible that different groups may have grown local plants such as gourds and chenopods at very early dates, the first evidence of maize cultivation in the Southwest dates from about 2100 BCE. Small, fairly undomesticated maize cobs have been found at five different sites in New Mexico and Arizona. Maize reached the present-day Southwest via an unknown route from Mexico and was rapidly adopted by peoples in the region. One theory states that maize cultivation was carried northward from central Mexico by migrating farmers, most likely speakers of a Uto-Aztecan language. Another theory, more accepted among scholars, is that maize was diffused northward from group to group rather than migrants. There is evidence that maize was initially cultivated in the Southwest during a climatic period when precipitation was relatively high. The peoples of the western area were traditionally dry farmers, relying on crops that can survive the mostly arid conditions. Many types of corn, beans and squash (often described as The Three Sisters) are cultivated successfully in the area. The women made and used pottery to hold their food and water. Farmers in the eastern areas of the territory developed methods of irrigating their crops. 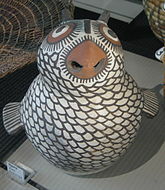 The various Pueblo communities have different traditions regarding the making and decoration of pottery artifacts. Present-day archaeologists date the use of pottery by Puebloans dating back the early centuries of the Common Era. In Native communities of the Southwest's belief system, the archetypal deities appear as visionary beings who bring blessings and receive love. A vast collection of religious stories explore the relationships among people and nature, including plants and animals. Spider Grandmother and kachina spirits figure prominently in some myths. Pueblo prayer included substances as well as words; one common prayer material was ground-up maize—white cornmeal. A man might bless his son, or some land, or the town by sprinkling a handful of meal as he uttered a blessing. After the 1692 re-conquest, the Spanish were prevented from entering one town when they were met by a handful of men who uttered imprecations and cast a single pinch of a sacred substance. The Pueblo peoples used ritual 'prayer sticks', which were colorfully decorated with beads, fur, and feathers. These prayer sticks (or 'talking sticks') were similar to those used by other Native American nations. By the 13th century, Puebloans used turkey feather blankets for warmth. Most of the Pueblos hold annual sacred ceremonies, some of which are now open to the public. Religious ceremonies usually feature traditional dances that are held outdoors in the large common areas and courtyards, which are accompanied by singing and drumming. Unlike kiva ceremonies, traditional dances may be open to non-Puebloans. Traditional dances are considered a form of prayer, and strict rules of conduct apply to those who wish to attend one (e.g. no clapping or walking across the dance area or between the dancers, singers, or drummers). Since time immemorial, Pueblo communities have celebrated seasonal cycles through prayer, song, and dance. These dances connect us to our ancestors, community, and traditions while honoring gifts from our Creator. They ensure that life continues and that connections to the past and future are reinforced. 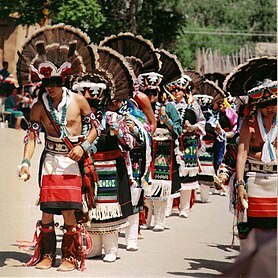 Traditionally, all outside visitors to a public dance would be offered a meal afterward in a Pueblo home. Because of the numerous outside tourists who have attended these dances in the pueblos since the late 20th century, such meals are now open to outsiders by personal invitation only. Private sacred ceremonies are conducted inside the kivas and only tribal members may participate according to specific rules pertaining to each Pueblo's religion. The public observances may also include a Roman Catholic Mass and processions on the Pueblo's feast day. Some Pueblos also hold sacred ceremonies around Christmas and at other Christian holidays. The Spanish government demanded labor and tribute from the Pueblos and vigorously attempted to suppress native religion. (...) In that year  Diego de Vargas re-entered Pueblo territory, though it was not until 1696 that he gained control over the entire Rio Grande Pueblo area. The Spaniards had learned from the Pueblo Revolt and were gentler in their demands in the next century and a half. However, the Pueblos had learned as well and maintained their ceremonial life out of the view of the Spaniards, while adopting a veneer of Roman Catholicism. Acoma Pueblo – Keres speakers. Known for its location atop a mesa. Established in the 12th Century, it is one of the oldest continuously inhabited places in the United States. Isleta Pueblo – Tiwa speakers. Established in the 14th century. Located on the southern outskirts of Albuquerque. Jemez Pueblo – Towa speakers. Known for its runners and running ceremonies. Kewa Pueblo (formerly Santo Domingo) – Keres speakers. Known for turquoise work and the Corn Dance. Laguna Pueblo – Keres speakers. Known for its well-preserved 17th Century mission church. Nambé Pueblo – Tewa language speakers. Established in the 14th century. Was an important trading center for the Northern Pueblos. Ohkay Owingeh Pueblo (formerly San Juan) – Tewa speakers. Headquarters of the Eight Northern Indian Pueblos Council. Home of Popé, one of the leaders of the1680 Pueblo Revolt against Spanish colonizers. Picuris Pueblo – Tiwa speakers. Pojoaque Pueblo – Tewa speakers. Re-established in the 1930s. Sandia Pueblo – Tiwa speakers. Established in the 14th Century. Located on the northern outskirts of Albuquerque. San Felipe Pueblo – Keres speakers. San Ildefonso Pueblo, Tewa speakers. Famous for its valuable black-on-black pottery. Located between Pojoaque and Los Alamos. Santa Ana Pueblo – Keres speakers. Santa Clara Pueblo, – Tewa speakers. Established in the 16th Century. Located near Española. Taos Pueblo – Tiwa speakers. Known for its architecture. Established in the 11th Century, it is one of the oldest continuously inhabited places in the United States. Tesuque Pueblo – Tewa speakers. Located near Santa Fe. Zia Pueblo – Keres speakers. Known for their sun symbol, which is New Mexico's state flag. Zuni Pueblo – Zuni speakers. Known for being the first Pueblo visited by the Spanish in 1540. Ysleta del Sur Pueblo, El Paso, Texas – originally Tigua (Tiwa) speakers. Also spelled 'Isleta del Sur Pueblo'. This Pueblo was established in 1680 as a result of the Pueblo Revolt. Some 400 members of Isleta, Socorro and neighboring pueblos were forced out or accompanied the Spaniards to El Paso as they fled Northern New Mexico. The Spanish fathers established three missions (Ysleta, Socorro, and San Elizario) on the Camino Real between Santa Fe and Mexico City. The San Elizario mission was administrative (that is, non Puebloan). Some of the Piro Puebloans settled in Senecu, and then in Socorro, Texas, adjacent to Ysleta (which is now within El Paso city limits). When the Rio Grande flooded the valley or changed course, as it commonly has over the centuries, these missions have sometimes been associated with Mexico or with Texas due to the changes. Socorro and San Elizario are still separate communities; Ysleta has been annexed by El Paso. The Texas Band of Yaqui Indians are descended from the Yaqui or "Yoeme" people, the most southern of the Pueblo peoples of the Cahitan dialect. They were prevalent throughout the entire southwestern states of Sonora and Chihuahua in Mexico; and in Texas, Arizona, and California of the United States. The Texas Band are descendants of Mountain Yaqui fighters who fled to Texas in 1870, after having killed Mexican soldiers in the State of Sonora. Many of their descendant families organized as a band with self-government in 2001; they have been recognized as a tribe by a legislative resolution of the state of Texas. all members have documentation of Yaqui ancestry dating to Yaqui Territory of the 1700s. Firecracker pueblo, Jornada Mogollon culture, abandoned 2nd half of the fifteenth c., excavated beginning 1980. Illustrates the evolution from pit-houses to a linear array of 15-17 rooms. The walls were coursed adobe; the floors were plastered caliche. Room 11 had metates and a mano for grinding corn. (Note that metates exist in the stone floors of caves of nearby Hueco Tanks as well.) Located in El Paso County, Texas. Although most present-day pueblos are known by their Spanish or anglicized Spanish name, most Pueblos have a unique name in each of the different languages spoken in the area. The names used by each Pueblo to refer to their village (endonyms) usually differs from those given to them by outsiders (their exonyms), including by speakers of other Puebloan languages. Centuries of trade and intermarriages between the groups are reflected in the names given to the same Pueblo in each of the languages. The table below contains the names of the New Mexican pueblos and Hopi using the official or practical orthographies of the languages. Despite not being a Puebloan language, Navajo names are also included due to prolonged contact between them and the several Pueblos. With the exception of Zuni, all Puebloan languages, as well as Navajo, are tonal. However, tone is not usually shown in the spelling of these languages save for Navajo, Towa and Tewa. In the table above, low tone is left unmarked in the orthography. Vowel nasalisation is shown by an ogonek diacritic below the vowel; ejective consonants are transcribed with an apostrophe following the consonant. Vowel length is shown either by doubling of the character or, in Zuni, by adding a colon. San Ildefonso Pueblo Feast Day: January 23. Texas Band of Yaqui Indians Easter Observance Dance of the Coyotes. Sandia Pueblo Feast Day: June 13. Ysleta / Isleta del Sur Pueblo Feast Day: June 13. ^ a b Sando, Joe S. (1992). Pueblo nations : eight centuries of Pueblo Indian history (1st ed.). Santa Fe, NM: Clear Light. ISBN 0940666170. OCLC 24174245. ^ a b c d Sutton, Logan (2014). Kiowa-Tanoan: A Synchronic and Diachronic Study. Albuquerque, NM: University of New Mexico. ^ Fred Russell Eggan, Social Organization of the Western Pueblos, University of Chicago Press, 1950. ^ Cordell, Linda S. Ancient Pueblo Peoples, St. Remy Press and Smithsonian Institution (1994); ISBN 0-89599-038-5. ^ Paul Horgan (1954), Great River',' vol. 1, p. 286. Library of Congress card number 54-9867. ^ Gregg, J. 1844. Commerce of the Prairies, Chapter 14: "The Pueblos", p. 55. New York: Henry G. Langley. ^ a b Merril, William L. (2009). "The Diffusion of Maize to the Southwest United States and its Impact". Proceedings of the National Academy of Sciences of the United States of America. 106 (50). ^ "Turkeys domesticated not once, but twice", physorg.com; accessed September 2015. ^ "Indian Pueblo Cultural Center". ^ Ortiz, Alfonso (1979). Handbook of the North American Indian - Volume 9 The Southwest. p. 4. ^ "19 Pueblos". Archived from the original on 2015-10-07. Retrieved 2015-09-22. ^ Young, Robert W.; Morgan, William (1980). The Navajo language : a grammar and colloquial dictionary (1st ed.). Albuquerque: University of New Mexico Press. ISBN 0826305369. OCLC 6597162. ^ "Keres Language Project". Keres Language Project. Retrieved November 13, 2018. ^ Yumitani, Yukihiro (1998). A Phonology and morphology of Jemez Towa. University of Kansas Dissertation. ^ Albert, Roy; Shaul, David Leedom (1985). A concise Hopi and English lexicon. Philadelphia: J. Benjamins. ISBN 9027220158. OCLC 777549431. 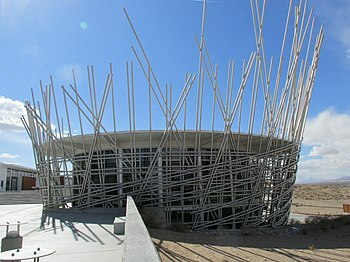 Indian Pueblo Cultural Center in Albuquerque, NM offers information from the Pueblo people about their history, culture, and visitor etiquette. Gram, John R. (2015). Education at the Edge of Empire: Negotiating Pueblo Identity in New Mexico's Indian Boarding Schools. Seattle: University of Washington Press. Paul Horgan, Great River: The Rio Grande in North American History. Vol. 1, Indians and Spain. Vol. 2, Mexico and the United States. 2 Vols. in 1. Wesleyan University Press 1991. Elsie Clews Parsons, Pueblo Indian Religion (2 vols., Chicago, 1939). Parthiv S, ed. Handbook of North American Indians, Vol. 9, Southwest. Washington: Smithsonian Institution, 1976. Julia M. Keleher and Elsie Ruth Chant (2009). THE PADRE OF ISLETA The Story of Father Anton Docher. Sunstone press Publishing. Wikimedia Commons has media related to Pueblo people. 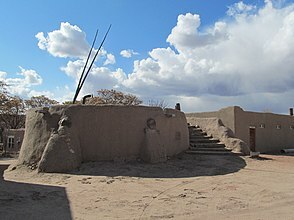 Wikivoyage has a travel guide for New Mexico Pueblos.